This once a month topical cream will keep your scrappy little friend in good shape without the ugly necessity of force feeding him/her an unpalatable tablet. So if your dog is 4 kg (8.8 lbs.) or less, scientifically safeguard its quality of life as soon as possible using the patented Advocate 6 Pack Small Dog formula. Can I use it to 2kg dogs? My dog is 2kg. 1 You say that this is a cream, Where is it applied? Previous purchases were applied as drops. 2 A 6 pack lasts 6 months, I don't want a supply every 3 months. 1. It is not a cream. There is liquid in every tube as you have previously used. We recommend you to apply between the shoulder blades of your dog to prevent your dog licking or scratching it. 2. We just added the 6 months option. It was a mistake from our end. IS this ok for an 8 week old puppy? 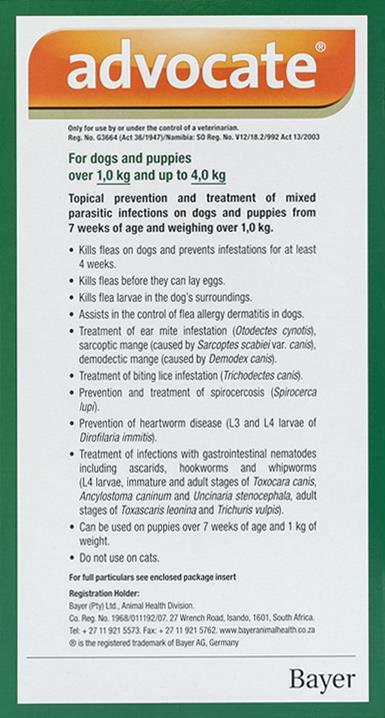 Advocate is licensed for use on dogs older than 7 weeks of age so yes it is dafe to use on 8 weeks old pupy. A great product at a reasonable price and shipped quickly.